A Zorro III only graphics card. It has a pixel clock of 135Mhz (8bit), 80Mhz (16bit) and 50Mhz (24bit). It also contains a built-in monitor switcher and hardware support for chunky to planar conversion and a digital video expansion bus. The card was available in two versions, one with 2MB of VRAM, the other with 4MB of VRAM. The 2MB version can be upgraded by simply fitting the correct VRAM chips into the sockets. 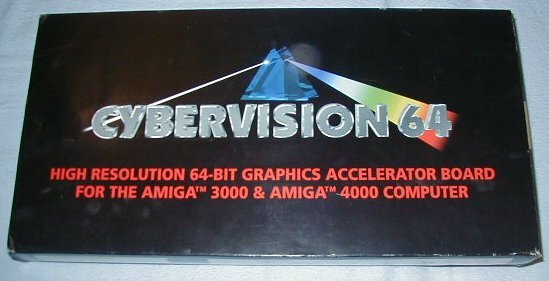 Note, the Cybervision 64 should not be confused with the Cybervision 64/3D, they are completely different graphics cards.